Homemade Baked Pita Chips | How to Make the Best Pita Chips!Homemade Baked Pita Chips | How to Make the Best Pita Chips! 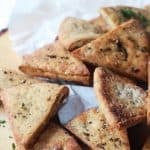 A classic recipe for crispy Homemade Baked Pita Chips! These crunchy pita chips are healthy, easy to make and perfect for snacking. In a small bowl, mix olive oil, basil, pepper, and garlic powder. Place pita triangles on a baking sheet lined with parchment paper or a silicon mat, brush one side with the olive oil mixture. Bake pita bread for 8-10 minutes, until slightly browned.